The Milwaukee Bucks finalized their deal with Chicago, sending point-guard Michael Carter-Williams to the Bulls in exchange for backup shooting guard Tony Snell. Snell averaged 5.3 points and 3.1 rebounds a game in 64 games (33 starts) for the Bulls last season. In the last two seasons with the Bulls, Snell has shot 37.1 percent (2014-15) and 36.1 percent (2015-16) from the three-point arc. 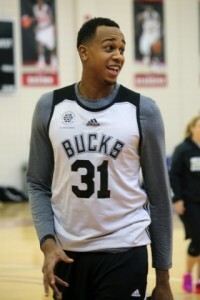 Carter-Williams appeared in 54 games (37 starts) for the Bucks last season and averaged 11.5 points, 5.2 assists and 5.1 rebounds in 30.5 minutes a game. He was originally the 11th overall pick of the Philadelphia 76ers in the 2013 NBA Draft out of Syracuse. The Bucks acquired Carter-Williams in a Feb. 19, 2015 trade with Philadelphia. The Milwaukee Bucks dropped their second straight preseason game, 107-86 to the Chicago Bulls. The Bucks jumped out to a 17-point halftime lead but were outscored in the fourth quarter 37-7. Jabari Parker scored a team-high 21 points and added six rebounds to lead the Bucks. 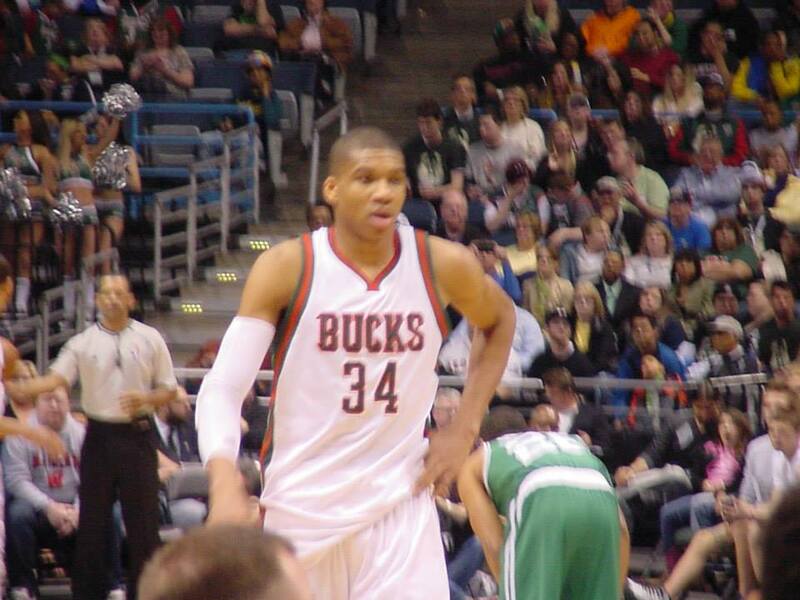 Giannis Antetokounmpo had 14 points, six rebounds and four assists. Isaiah Canaan scored 25 points and Doug McDermott added 22 points to lead the Bulls (3-2). The Bucks (2-2) have two preseason games left, Monday at Detroit and Wednesday night at home against Indiana. After the game, the worked out a deal with the Bulls, sending guard Michael Carter-Williams for shooting guard Tony Snell. The trade is expected to be finalized on Monday. Snell averaged 5.3 points and 3.1 rebounds while averaging 20 minutes a game for the Bulls last season. While Giannis Antetokounmpo will handle the ball for the Bucks on offense, it’ll be Matthew Dellavedova, rookie Malcolm Brogdon and Jason Terry that will cover opponent point guards on defense. The Milwaukee Bucks reserves outscored their starters 57-36 and went on to knock off the Chicago Bulls 93-91 in the preseason opener for both teams in Chicago. Greg Monroe had 15 points and nine rebounds, Michael Carter-Williams had 10 points and a team-high 11 rebounds while dishing out six assists. Matthew Dellavedova and Michael Beasley each added 11 points. Rashad Vaughn was 0 for 6 from the field before hitting the game winning three-pointer with just over a half-minute to play. The Bucks hit 10 of 25 three-pointers. Jimmy Butler and Doug McDermott each had 13 points to lead the Bulls. Dwyane Wade, playing in his first official game with the Bulls since signing as a free agent over the summer, had six points in 12 minutes. Milwaukee Bucks point guard Michael Carter-Williams will miss the rest of the season due to a hip injury and undergo surgery on Thursday. Carter-Williams will have surgery for a torn labrum in his left hip in Colorado. The 24-year-old Carter-Williams is in his second season with the Bucks after being acquired at the trade deadline in February 2015. The former NBA rookie of the year was acquired from Philadelphia in a three-team deal and the Bucks sent point guard Brandon Knight to Phoenix as part of the swap. Carter-Williams has played in 54 games with 37 starts this season. he averaged 11.5 points, 5.1 rebounds and 5.2 assists a game. Carter-Williams and center Greg Monroe were moved out of the starting lineup on Feb. 9th and have been coming off the bench ever since. O.J. Mayo and Miles Plumlee took their place in the Bucks starting lineup. 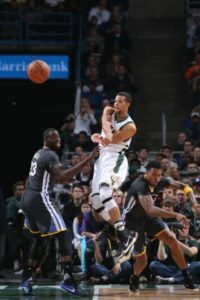 The Milwaukee Bucks saw their five-game losing streak come to an end, knocking off the red-hot Boston Celtics 112-111 at the BMO Harris Bradley Center on Tuesday night. Bucks coach Jason Kidd decided to shake things up by shuffling his starting lineup. Miles Plumlee and O-J Mayo were both moved to the starting lineup while Greg Monroe and Michael Carter-Williams played off the bench. It was the first time this season that Monroe didn’t start, but he responded with a season high 29 points and 12 rebounds. The Milwaukee Bucks needed overtime to pull out a 108-101 win over the Atlanta Hawks at the BMO Harris Bradley Center on Friday night. 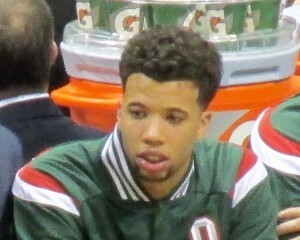 Michael Carter-Williams blocked a Jeff Teague shot in the closing seconds of regulation to force overtime and the Bucks dominated the extra session to pull out the win. Giannis Antetokounmpo paced the Bucks (17-25) with 28 points and a career-high 16 rebounds while playing a game-high 50 minutes. He posted his third consecutive double-double, the first time he has done that in his pro career. 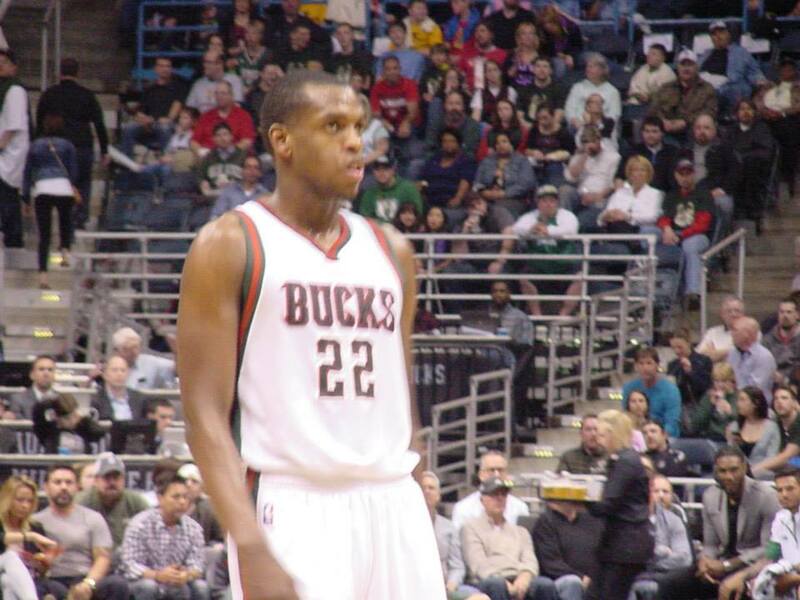 Khris Middleton had 26 points and Michael Carter-Williams added 15 points, nine rebounds and seven assists. All five Bucks starters were in double figures and John Henson had 10 points, seven rebounds and tied a season high with six blocks in 31 minutes off the bench. The Bucks return to the court, traveling to Charlotte to face the Hornets tonight. The Milwaukee Bucks had no answer for New York’s top draft pick, 7-foot-3 big man Kristaps Porzingis, who scored 15 points, pulled down six rebounds and blocked five shots in 30 minutes of playing time. Porzingis also hit two-of-five from three-point range in the Knicks 100-88 win at Madison Square Garden on Sunday night. 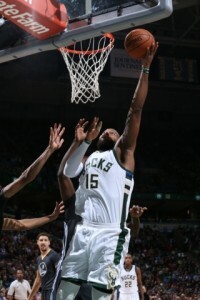 The Bucks (15-24) were out-scored 44-32 in the paint and trailed by ten points at the half. But that deficit quickly grew to 22-points in the fourth quarter after being outscored 31-19 in the third. Greg Monroe had 28 points and ten rebounds, but the Bucks shot just 40% from the field and made only three-of-13 from three-point range. Khris Middleton added 20 points and Michael Carter-Williams was held to just 1-of-8 from the field, finishing with four points. 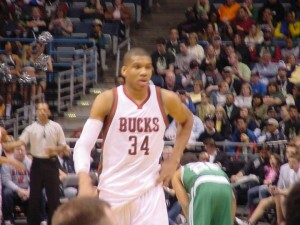 The Bucks had to play without key reserves O.J. Mayo and Jerryd Bayless, both out with injuries. They’re back home to host the Chicago Bulls at the BMO Harris Bradley Center on Tuesday. The Milwaukee Bucks defense was a no-show in Chicago as the Bucks fell to the Bulls 117-106 in Chicago at the United Center. The Bucks never led in the game and allowed the Bulls to shoot 61-percent from the field in the first half and 55-percent for the game. The San Antonio Spurs became the second NBA team to 30-wins, knocking off the Milwaukee Bucks 123-98 at the BMO Harris Bradley Center on Monday night. Kawhi Leonard poured in 24 points and rookie Jonathon Simmons added 18 points for the Spurs (30-6) in the win. The Bucks (14-22) shot 76% in the first quarter, hitting 13 of 17 from the field, but the Spurs held them to 19 points in the second quarter. The Spurs outscored the Bucks 60-42 in the paint. The Bucks entered the game ranked number-one in the league in paint points. 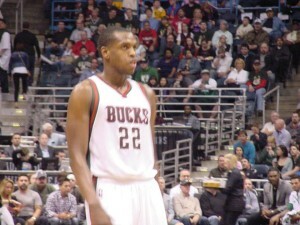 Khris Middleton scored 19 points to lead four Bucks in double figures. Michael Carter-Williams added 16 points, center Greg Monroe had 15 points and forward Jabari Parker added 14 points in the loss. The Bucks also lost backup point guard Jerryd Bayless in the second quarter with an ankle injury. It’s the same ankle he sprained in a game at Detroit on Dec. 4, an injury that kept him out of the next 11 games.